Last week, Timor-Leste newspapers published an Intent to Award nearly three million dollars in contracts for school furniture. La'o Hamutuk was astonished to see that more than $1 million will go to Chinese Nuclear Industry Construction Company No. 22, which had performed atrociously after it got a $300 million contract in 2008 to build Timor-Leste's power plants and national electricity grid. We met with the Chair of the National Procurement Commission to express our concerns and wrote a formal protest letter (Tetum translation). The rest of this blog is adapted from our 8 October letter to President Aniceto do Rosario of the National Procurement Commission. As we discussed last Friday, La’o Hamutuk has concerns regarding the Intent to Award two contracts totaling $1,047,559 to Chinese Nuclear Industry Construction Company No. 22 (CNI22) to supply school chairs and tables. We believe that it would be inappropriate to award contracts to this company, with which Timor-Leste has had extensive experience. CNI22 may not be blacklisted by the World Bank or other international agencies, perhaps because they have never done business with them. As a Chinese state-owned company, they may be protected against honest assessments by international agencies. However, this must not prevent Timor-Leste from learning from our own experience. We are relieved that CNI22’s contract for the national electricity project is nearing completion. However, the company is looking for more of Timor-Leste’s money through this school furniture tender, the Suai Airport, and perhaps other contracts. We hope that they will never receive another contract from Timor-Leste. 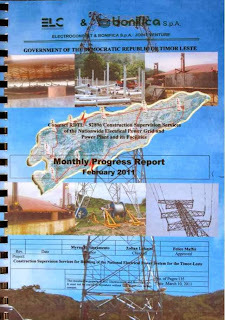 In mid-2008, CNI22 proposed to Timor-Leste to build a national electricity system involving three second-hand heavy oil generating stations and a national high-voltage grid. As reported in detail on La’o Hamutuk’s website and in our Bulletin, Timor-Leste awarded CNI22 a $367 million contract, the largest in the nation’s history, in October 2008. The project was seriously flawed in concept, design, implementation, community relations, and quality of work. The company repeatedly failed to meet its commitments regarding keeping on schedule, quality of materials, employing Timorese workers, worker safety, and environmental management. They refused to comply with directives from the supervising consultant and others. After two years, when CNI22 had shown that it was incapable of building the power plants it had proposed, they were re-contracted to Puri Akraya Engineering, increasing the cost by hundreds of millions of dollars and delaying the project for several years. You don’t have to take La’o Hamutuk’s word for this. For the last four years, Timor-Leste has hired ELC/Bonifica to supervise the power project construction. Their monthly reports describe CNI22’s “overall performance” as “poor” nearly every month. Last week, at a seminar in the Ministry of Public Works on this project, ELC Project Manager Massimiliano de Carli reiterated several times that: “The most important element in implementing any project is selecting the right contractor, appreciating their proved experience, skills and capabilities.” It is obvious to people with detailed knowledge of CNI22’s work on the electricity project that CNI22 should not have been selected, and we are puzzled that Timor-Leste wants to give them more business. In July 2008, news surfaced that the government would purchase two large electricity generating plants from a Chinese firm that would also be contracted to put into place a nationwide transmission grid. 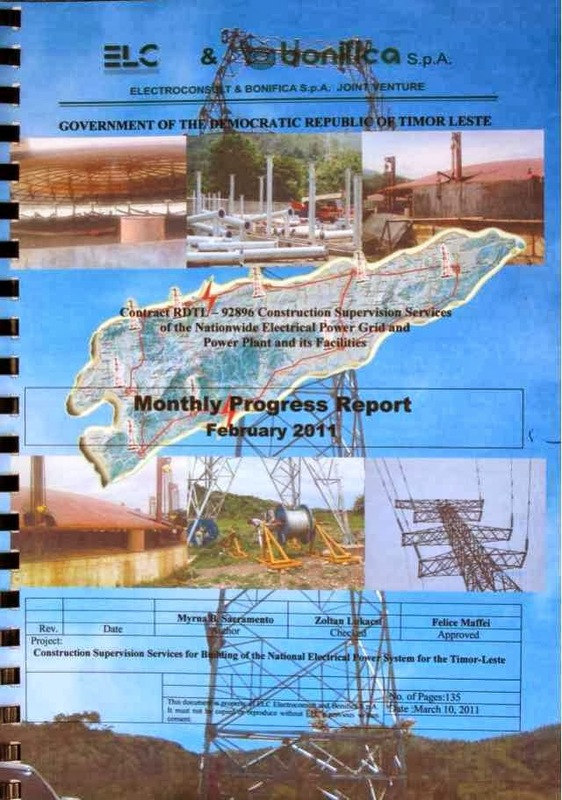 On this occasion, the government issued an international tender, although the widespread understanding in Dili was that the purchase had been agreed before the government announced the tender. Although observers described the tender announcement as insubstantial and technically inadequate, fourteen international firms submitted bids. The decision to award the contract to the Chinese firm again was made by the prime minister with very little consultation with line ministers. The power plants are old equipment (with some 40 years of service in China already behind them) that will be dissembled, exported and refitted in Timor-Leste. They will burn heavy oil that Timor will have to import. Experts describe the contracted installation of a national transmission grid within two years as a fantasy. The World Bank reportedly has urged the government to cancel the contract, absorb the penalty, and re-tender the project. During the past 50 years, CNI22 has completed more than 2000 construction and installation works, and the total construction area was over 2 million m2. Our company has undertaken a large number of construction works of power plants, factories, housing, airports, bridges, roads etc, and for the good quality of our projects and technology innovation, CNI22 is awarded more than 80 national and provincial and municipal prizes, including the construction engineering “Luban Prize”. CNI22 have offices in 39 countries, and we still have Projects under construction in Algeria, Sudan, Pakistan, Mongolia, Vietnam and East Timor. In the field of civil engineering, Our company possesses 8 grade-1 qualifications, including housing construction, electrical engineering, mechanical and electrical installation works, steel works, the installation of lifting equipment, blasting and demolition engineering and nuclear engineering and so on. Finally, we encourage the National Procurement Commission to consider how contract awards can help Timor-Leste businesses grow, creating employment and keeping more of our national wealth in this country. Many Timorese companies can make chairs and desks appropriate for our schools, and this tender is a valuable opportunity to help them develop. Thirteen years ago, La’o Hamutuk and others raised this issue with the World Bank and AusAID, and the agencies made changes in procurement of school furniture to enable local companies to participate. Today, in this sovereign nation spending our own money, we should not throw away this opportunity. CNI22 will import furniture from China, sending our people’s money outside the country. Their record gives ample reason not to trust the quality or timeliness of their promises. Many large tenders here require skills, resources or experience that Timor-Leste companies do not yet possess, making it even more important to ensure that tenders which do not have such complex requirements, like this one, will use locally-made products rather than those imported from afar. We encourage the National Procurement Commission not to award this or any other contract to Chinese Nuclear Industry Construction Company No. 22, and to develop a system of blacklisting companies which have shown bad faith, incompetence or other inability to meet their commitments. La'o Hamutuk hopes that everyone who wants Timor-Leste's finite petroleum wealth to be used appropriately will pay close attention to procurement processes announced in the newspapers and the Ministry of Finance website and recently reopened Procurement Portal. Transparency is only useful if people are watching! P.S. Al Jazeera later reported this story, based on La'o Hamutuk's information. To me it is most likely as political approach rather than technical approach, TL very poor in human capacity most people who work with Government they are chosen through political appointment not based on education background. you might images politic party is lack of capitals to gain some funds i believe they will using company which is agree to share any % to their pocket. There must be some financial interest going on between some decision makers in Ministry Education with Chinese Company. Absolutely agree that tenders of this sort - ie for works that can be done inside T-L - should be restricted to local companies which employ local labour. Seems very short-sighted not to do this even if some foreign company can deliver the final goods for a cheaper price. I understand the Bamboo Furniture Factory near Dili has the capability to make better quality school furniture at the same price as such furniture previously imported. The Bamboo Center in Tibar does excellent work. In fact, La'o Hamutuk purchased most of the chairs, desks and tables in our office from there. However, I don't think they have the capacity to produce this entire tender, and neither does any other Timor-Leste carpenter. The two lots intended for CNI22 include 3,741 single chairs, 3,269 double chairs and 2,240 tables. This is enough work to share among many carpentry shops here -- providing jobs and developing skills for several hundred Timorese workers. What an opportunity! I don't know the rational behind. It sames go to CHEC which was the lowest price in Suai Airport tender, but the National Procurement Committee awarded to PT Waskita Karya... I don't understand why Timor people needs to pay more $12million for this??? Any comment and insider news? ?